WAIST HIGH: Love Hope Strength. A cancer awareness group and a team of British and US musicians claim to have staged the world's highest concert - on the slopes of Mount Everest. 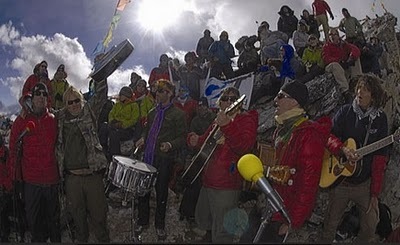 The US-based Love Hope Strength Foundation said the Everest Rocks concert was held at 18,540ft. Earlier, the group said it intends to register the performance with Guinness World Records. Six musicians performed at the concert - Mike Peters of The Alarm, Slim Jim Phantom of the Stray Cats, Cy Curnin and Jamie West of the Fixx, and Glenn Tilbrook and Nick Harper of Squeeze. The group of more than 30 trekked to their performance site at Kalapathar hill, near the base camp used by mountaineers scaling Everest, on October 21. "Today she (Everest) allowed our Love Hope Strength team to look at her charms from 18,540ft and to share with her some of our humble songs and to break the record for the world's highest concert on land," said Peters, a former cancer patient. Before leaving for the mountain, organisers said money raised from the performance would be used to buy equipment for the Bhaktapur Cancer Hospital near Kathmandu. The Colorado-based Love Hope Strength Foundation (LHSF) is an international charity with chapters in the US, UK and Australia. Founded by leukemia survivors Mike Peters of the Welsh rock band the Alarm and President of CSI Entertainment James Chippendale with the goal of providing all cancer patients with the same opportunities that they had, including access to information, quality cancer treatment and the best medication available. The Love Hope Strength Foundation (LHSF) raises funds and awareness for international cancer centers and networks through music-related events and promotions.